The child was extraordinary. For several days, it lived with eyes closed in perfect health, without food. For days together, it never spoke. Distressed at this, the parents place the child at the shrine of Aadinathar, the deity of Kurugoor, surrendering into Him the entire burden of upbringing the child. For sixteen long years, Maran sat motionless under the tamarind tree in Adinathar temple without food or drink, eyes closed, in padmasana in utter silence. He was verily a SUN in human form with an aura encompassing the universe. 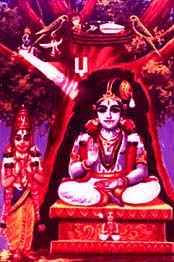 He is believed to be the Avatara of Vishwak-Sena, chief of the hosts of Sriman Narayana in Vaikuntam.